Good People, I’m just returning to Encinitas after an exotic spin in the Azerbaijani Phrygian Universe. 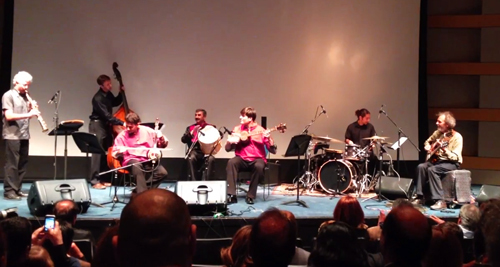 Picture the ultra hip Skirball Cultural Arts Center performance space filled with folks from all cultures taking in a musical journey from the roots music of the middle east meets western jazzologists. We had a great time with Imamyar and his cohorts and learned some of the finer points of his music and culture. And they too, I think got a taste of how it rolls when you let jazz music invade your life. From there the action moved from the concert stage to the banquet room with spectacular Azerbaijani inspired food for everyone. Soft diplomacy flowing in the form of music and cuisine working it’s wonders! And the celebration continues this week in San Diego with a repeat performance at the Westin Hotel. The only bummer is that it’s sold out. I really wish you could come and check it out but a bunch of other folks have already figured it out. The scene at the Skirball Center with enthusiastic musos exploring the inner workings of the phrygian mode. Click the photo to see the vid clip. 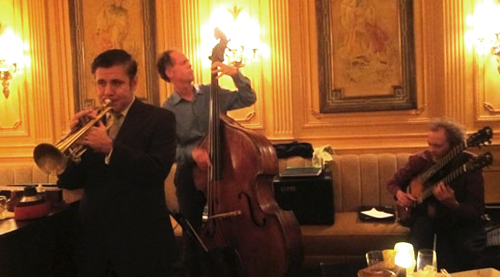 I had an inspired musical night with Gilbert Castellanos at the Westgate Hotel last weekend. This is a gig he does every week and his followers are super listeners with an innate knowledge of jazz mixed in with loads of enthusiasm. And the paramount reason it’s all working so well is because Gilbert’s trumpet playing is out of this world. He plays with a beautiful sound, great time, and his musical ideas, which are rooted in the history of jazz and beyond, flow from his trumpet effortlessly. It was pure magic and we even garnered an excellent review out of the deal. Check it out. Playing the Westgate gig with Gilbert on the left, Rob Thorsen on bass, and me on guitar. Up for this week, tonight (Thursday) we’re getting our trial run with a new set of music with my group Bop Moderno. It’s me along with Gilbert on trumpet, my brother Tripp on sax and flute, Gunnar on bass and Duncan on drums. I’ve always loved the sound of those classic Blue Note groups with sax and trumpet riding out front, stating the themes and who better to realize this sound than with Gilbert and Tripp. The repertoire for the group consists of my originals that I’ve spent the last couple of weeks arranging for two horns. It’s a SpragueBop wind and brass sprint influenced by N.Y.C., Brasil, New Orleans and back. And just to let you know, we’re bringing the same circus to LA and Carlsbad next week. We’ll be at the Los Angeles Music Academy on February 12 and the Museum of Making Music on February 16. I hope you can make it to one of these performances! 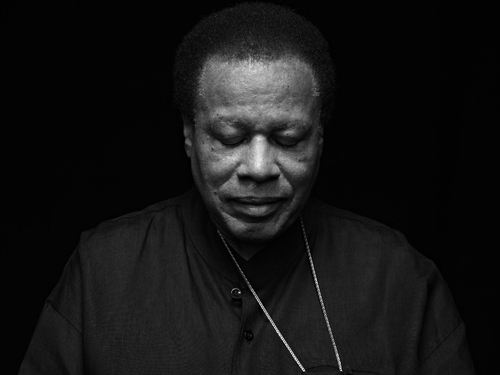 Thus spake the stellar saxophonist Wayne Shorter. He’s professing this and other zany Zen truths in this great PBS interview. I’ve always loved his music and to hear him talk about it cracks me up. What’s he’s saying? It’s deep, it’s brilliant, it’s out there and it’s just like his music. Bravo!